Why is marine debris a problem? Plastics and other marine debris are a major environmental concern and impact the value of our waterways and marine environment to different people (e.g. the tourism industry, recreational fishers etc.). Debris from either land or sea-based sources can travel huge distances and pose a navigation hazard. It can also potentially transport chemical contaminants, transport invasive species, and smother, entangle and harm marine wildlife. Plastic is the most common type of marine debris found on beaches in the Great Barrier Reef. It comprises between 50 to 90 per cent of all debris items recorded (GBRMPA, 2017); this is consistent with worldwide figures. As marine debris has been identified by the Partnership as an important pressure on the iconic waterways and marine environments of the Mackay-Whitsunday-Isaac region, the Partnership has committed to reporting both the problem of marine debris and the community response to cleaning it up. The Australian Marine Debris Initiative (AMDI) is a network of communities, schools, industries, government agencies and individuals focused on reducing the amount of marine debris washing into our oceans. The initiative includes a database, which enables volunteers and organisations who run marine debris clean-up events to collect data on what they were finding using a consistent methodology. This then means that the data can be collated into a standardised national database on marine debris. Since 2004 more than 9 million pieces of data have been inputted into the Australian Marine Debris Database. This creates a comprehensive overview of the amount and types of marine debris that are impacting beaches around the country. Data from the AMDI makes up the majority of marine debris data reported in the 2016 report card. The data below represents a summary of clean-up data from a number of organisations across the Mackay-Whitsunday-Isaac Region. Data is presented per Local Government Area (Mackay or Whitsunday) postcode. What is our marine debris made of? See below for the breakdown across the Whitsunday and Mackay Local Government Areas. What is the data showing? In comparison to 2015/16, there has been a substantial reduction in marine debris clean up effort in the Mackay-Whitsunday Region. 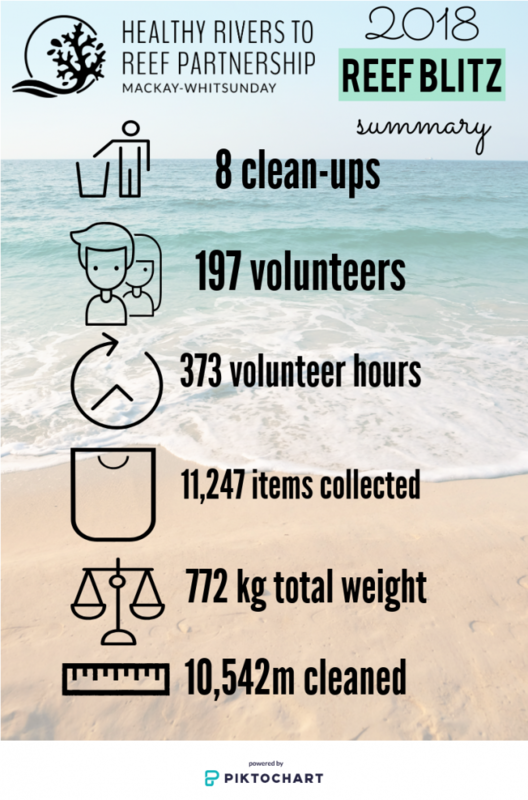 The breakdown of data per Local Government Area (LGA) shows there is a stronger regional clean-up effort in the Whitsunday region, with significantly more volunteer effort (hours plus number of volunteers) and consequently many more beaches cleaned and weight removed. The data also shows that the overwhelming majority of material collected in both LGAs is plastic. Based on 2016/17 data, marine debris is more likely to be sourced from the sea in both Mackay and the Whitsundays. Watch this space to see if the data changes for the 2017/18 reporting year and into the future. Healthy Rivers to Reef Partnership acknowledges the Australian Marine Debris Initiative, the community organisations and individuals involved in the collection and the provision of data used in this report. 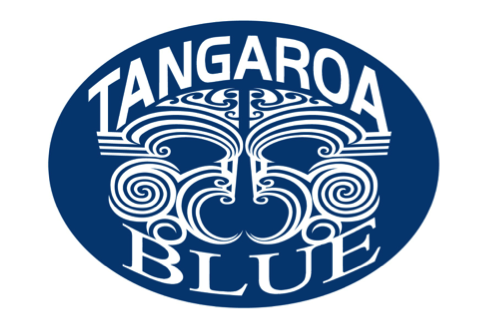 A special initiative called Reef Blitz was held in October 2018. This special series of regional clean-up events in the Mackay-Whitsunday Region were supported by the Mackay-Whitsunday Healthy Rivers to Reef Partnership and were led by the Reef Citizen Science Alliance. A summary is provided below. These data will be included in the total regional marine debris clean-up effort statistics in the 2019 report card.